Antarctica is shedding ice at a staggering rate. Scientists have discovered global warming has caused the melting of the ice on the continent to increase sixfold since 1979. This phenomenal rate of melting has seen global sea levels rise by more than half an inch – and experts predict it will get worse. Scientists have predicted a ‘multi-meter sea level rise from Antarctica in the coming centuries’ as a result of the vast loss of ice. Researchers discovered that, between 1970 and 1990, the continent was shedding an average of 40 gigatons of ice mass annually. This jumped to an average of 252 gigatons a year between 2009 and 2017. You may of course recall that it was only three years ago that the same NASA, who are behind this latest scare story, were telling us that the ice cap was actually growing in Antarctica. But more of that in a minute. There are several aspects to this latest story that need closer examination. Firstly, according to NASA’s own press release, the study only looks at data since 1992. 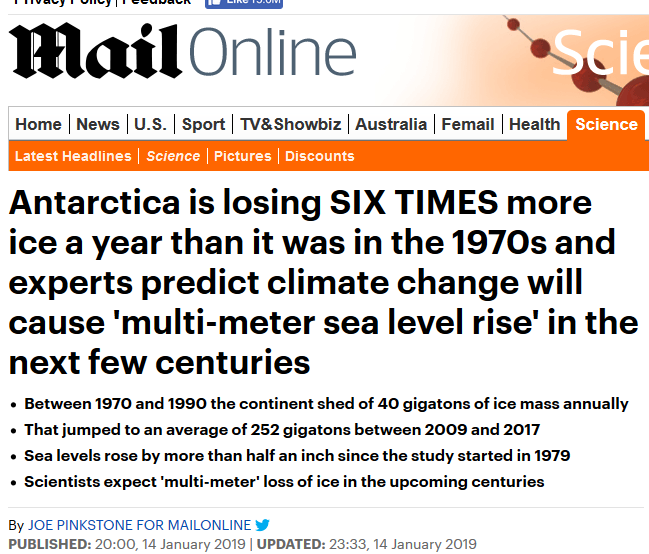 The Mail’s headline that “Antarctica is losing SIX TIMES more ice a year than it was in the 1970s “ is totally fake, as there is no data for the 1970s. Any estimates of ice loss in the 1970s and 80s are pure guesswork, and have never been part of this NASA IMBIE study, or previous ones. Secondly, the period since 1992 is a ridiculously short period on which to base any meaningful conclusions at all. Changes over the period may well be due to natural, short term fluctuations, for instance ocean cycles. We know, as the NASA study states, that ice loss in West Antarctica is mainly due to the inflow of warmer seas. The eruption of Pinatubo in 1991 is another factor. Global temperatures fell during the next five years, and may well have slowed down ice melt. Either way, Pinkstone’s claim that the ice loss is due to global warming is fake. It is a change in ocean current that is responsible, and nothing to do with global warming. Then there is his pathetic claim that “Antarctica is shedding ice at a staggering rate”. Alarmist scientists, and gullible reporters, love to quote impressive sounding numbers, like 252 gigatons a year. In fact, as NASA point out, the effect on sea level rise since 1992 is a mere 7.6mm, equivalent to 30mm/century. Given that global sea levels have risen no faster since 1992 than they did in the mid 20thC, there is no evidence that Antarctica is losing ice any faster than then. To call it staggering is infantile. NASA also reckon that ice losses from Antarctica between 2012 and 2017 increased sea levels by 3mm, equivalent to 60mm/century. Again hardly a scary figure. But again we must be very careful about drawing conclusions from such a short period of time. Since 2012, we have had a record 2-year long El Nino. What effect has this had? Far from losing ice, as the new study thinks, Zwally’s 2015 analysis found the opposite, that the ice sheet was growing. OK, Zwally’s data only went up to 2008, but there are still huge differences. Whereas Zwally estimates ice gain of between 82 and 112 billion tonnes a year between 1992 and 2008, the new effort guesses at a loss of 83 billion tonnes a year. It is worth pointing out that Zwally’s comment about the IPCC 2013 report refers to the 2012 IMBIE report, which was the forerunner to the new study, the 2018 IMBIE. Quite simply, nobody has the faintest idea whether the ice cap is growing or shrinking, never mind by how much, as the error margins and uncertainties are so huge. The best guide to such matters comes from tide gauges around the world. And these continue to show that sea levels are rising no faster then mid 20thC, and at a rate of around 8 inches per century. I have just tweeted Joe for a response. Yep, and the BBC went all “Project Hysteria” over this report at lunchtime today even going so far as to report that global sea level rise resulting from ice melting in the Antarctic could be 1.8m by the end of the century. I was watching with a horrified guest. When, however, I pointed out that this meant a rise of over 22mm per year, when compared to the non-anthropogenic sea level rise (that actually has been occurring) of approximately one tenth of that, she was reassured what a total load of tosh this was. It was covered in between all the Brexit shenanigans on the BBC breakfast news, and the 40-year timescale was also mentioned. I think I muttered some obscenity under my breath & wondered who knew what about the Antarctic ice melt in 1979, & hoped that Paul would investigate so that I wouldn’t have to. Happened upon this latest climate scare story on BBC News earlier today in Dublin. I eventually discovered where the room was where this new elephant was hiding. Turns out that the satellites, which the authors of this study used to measure melt erosion of the bays and basins of glaciers where they meet the oceans around Antartica, are incapable of observing snow either falling or having landed. So they programmed into their trusty computer models how much snow they think fell during an indeterminate period. They then assumed a catastrophic melt of that computer modelled snow and hey presto you arrive at multi gigatonnes of snow apparently adding to sea rise levels over and above what is actually happening naturally in this latest interglacial. In the pantheon of climatic make believe this is a classic. Media again not so much MIA but cheerleaders of this junk. Half an inch of sea level rise – run for the hills! Surely the unit of measure is the metre. Or am I just being old fashioned? The new Daily Mail is like the Daily Star, but lacking the journalistic integrity. I nominate the new Daily Mail for Bird Cage Lining of the Year. That should boost their circulation. You reminded me of a comment in the late 1960’s to The University of North Carolina at Chapel Hill’s campus rag, “The Daily Tar Heel”. In a letter to the editor, he observed that the paper came folded (quarters) so as to fit perfectly in the bottom of the bird cage. AND, since the contents of The Daily Tar Heel so closely resembled the contents of bottom of the bird cage, he did not have to change it for weeks. Climate alarmists’ noses are getting longer by at least an inch a year if this latest tripe is anything to go by. Imagine that, a government agency that supports both science and advocacy, even though they have opposite messages. That’s your all powerful government trying to do everything for everybody. In others words a great waste of taxpayer’s monies. What is obvious is how the Democrats jump “pole to pole” when the conditions meet their demands. During an El Niño, one pole is affected. During a La Niña, the other pole is affected. Also, global warmists told us that the Arctic was going to be ice free by now. They are now saying, “Don’t look there, but look here.” It’s called misdirection. 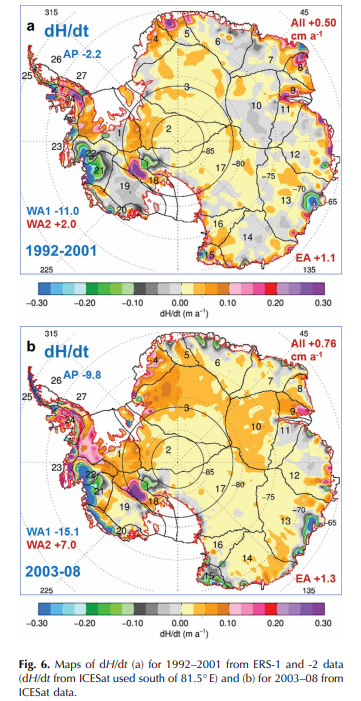 I looked at Zwally 2015 when looking at a BBC post on increasing rates of ice melt in some East Antarctica. This blamed the increased melt on local changes in ocean currents, with no mention of net actual ocean warming. However, the NASA study did not mention the existence of a large number of volcanoes under West Antarctica. A problem is that the 252 Gigatonnes is a vast amount when close up. Lake Windermere only has about 1 gigatonne of water. But it is only like skimming 20 mm off a year over an ice sheet that averages over 2,000,000 mm in depth. Zwally 2015 tried to map where the average losses or gains where occurring. The colour bands cover 25mm. Most areas have almost negligible changes. on average. It is on the coast that the biggest losses are occurring. Most researchers stay near the coast as well. Has “Wadders” joined NASA: if so when will the Antarctic be ice free?